The coaching duo left Solomon Islands on Friday and will spend more than 2 weeks away from home. During this time they will be privy to some of the best coaching instructors and facilities in the world as they train under the FA International License coaching course. Both coaches were in good spirits at their departure and were determined that they would do their best and complete the FA training successfully. Moli said that this is an important opportunity for him and he intends to make use of it to help bring forward football in Solomon Islands. Their travel to England and participation in the FA International License coaching course is being enabled by the 2006 Memorandum of Understanding between SIFF and the English FA. According to SIFF Technical Development Officer, Noel Wagapu, Moli and Eroi were selected based on their coaching qualifications and their involvement with national teams and local clubs. “Both coaches are well qualified because they have attended Level 1 and Level 2 coaching courses under the FA program and have been active locally,” Wagapu said. Wagapu said that SIFF is confident that Moli and Eroi will do well in the course and wished both coaches all the best. The SIFF/English FA MOU has seen Solomon Islands benefit from annual FA conducted coaching courses held both locally and overseas in England previously. The next locally held FA course will be in November. The last 2 locals to attend the FA International License coaching course were Gideon Omokirio and Commins Menapi, both senior members of the Solomon Islands Senior Men’s National Football Team. Other local coaches who have attended the course include Moses Toata and Derek Taka. 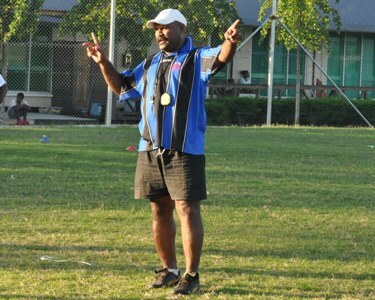 Moli is the current Solomon Islands Senior Men’s National Team head coach. His selection is specifically aimed at the preparations of the national team for the Pacific Games in 2011. Eroi was the coach who led a Solomon Islands women’s football team to its highest ever finish in a regional competition at the Oceania Football Confederation (OFC) Women’s U-17 Championship where they won second place.